Short activity for individual or small group completion to use the correct form the the verbs and tenses given to complete the post card message. 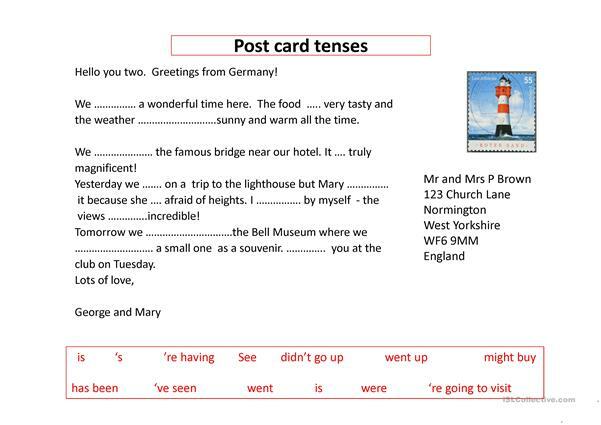 Uses simple present and past tenses and present perfect. A bit of fun to round off a more serious session. This downloadable handout is best suited for business/professional students, high school students and adults at Elementary (A1) and Pre-intermediate (A2) level. It is a valuable material for enhancing your students' Spelling, Reading and Writing skills. I have been teaching English to adults and teenagers in France since Feb 2011. Improving by the day!